The United Front is the first team built to welcome any skater of any gender identification. We talk to its captain to find out what this means for derby. Pioneer Valley Roller Derby is what you might call a trendsetter. In 2006, as women’s teams around the country were beginning to form the structure that would eventually become the WFTDA, PVRD did something that went against the grain: Create the first-ever men’s roller derby team, the Dirty Dozen. With time, that team helped to pave way for men’s players to be seen as equals on the track. After that acceptance came growth. With that growth came the Men’s Roller Derby Association. Then the Men’s Roller Derby World Cup. At the rate the men’s game is blossoming today, it can only keep going from here—and it all started when Pioneer Valley bucked the established trend. Recently, the league has identified another trend worth bucking. As the participation rate in men’s and women’s games keep expanding, a literal gender gap is emerging. The roller derby community is welcoming to athletes that identify as transgender. However, the current binary landscape of organized derby has not been a perfect fit for them. Individual leagues or an overseeing governing body can at least prevent discrimination through gender policies, but they don’t give trans* athletes an arena to call their own. 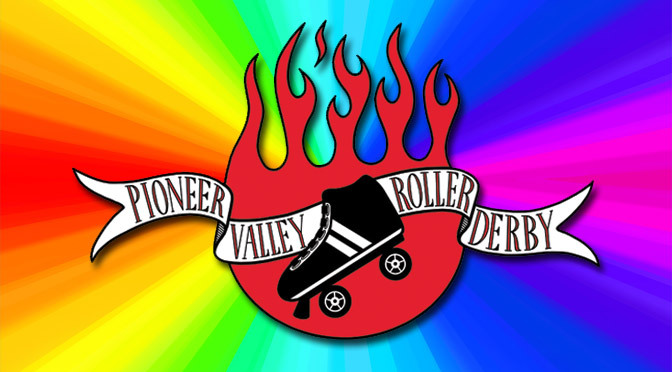 Pioneer Valley is giving them one by forming the United Front, the first all-gender/no-gender roller derby team. The United Front is open to any bout-ready skater that self-identifies any way he, she, or they chooses, and in any manner of sexual preference, gender identity, or gender expression. This groundbreaking concept in roller derby—and maybe in all of sports—is a natural fit for PVRD. Having been a co-ed league since nearly its inception, it has always been open to skaters of any gender. “However, as we gained more non-binary members, it became more clear that having just single-gender teams that skaters can self-select didn’t address their needs,” said Mai Tai Fighter, the team captain for United Front. “For those of us who exist within the binary it can be easy to overlook or not recognize the discomfort of non-binary individuals constantly being required to pick between two options that they might not feel they belong in. Pioneer Valley is positioning its all-gender team differently than the typical co-ed team that many are familiar with today. While it isn’t locked to a single gender, co-ed is still traditionally a term for men and women—a binary setup that by strict definition excludes those that don’t identify as either. “We use the terms ‘all-‘ and ‘no-gender’ to be all-inclusive of gender identities,” Mai Tai Fighter says, explaining how the all-ed setup of the team is deliberate, to differentiate itself from the boys & girls nature of co-ed play. The United Front will be making their on-track debut on May 16 in the first game home double-header, opposite a mash-up team of skaters from leagues around the western Massachusetts area. But beyond that, history may be repeating itself a little bit. As PVRD discovered in 2006, the problem with creating the first men’s roller derby team is that it can’t exactly play an opponent until somebody else forms the second men’s roller derby team. In creating the first all-gender roller derby team, Mai Tai Fighter realizes there may be some difficulty in finding opponents for it—at first. A lot of those opponents will likely come from skaters and teams affiliated with the WFTDA and MRDA, given how prolific those organizations are. Pioneer Valley itself is a member of the MRDA thanks to the Dirty Dozen. However, despite having one of the first women’s teams in the world, Western Mass Desturction, it is not a WFTDA member league. WFTDA which forbids its entry due to a policy requiring leagues be majority-owned and operated by women. If there comes a time when more leagues, WFTDA or MRDA leagues in particular, start thinking about fielding all-gender teams like the United Front, Mai Tai Fighter realizes there are two sides to the coin. In the long run, gender policies are things that the membership of both organizations will need to hammer out to be more representative of the day and age we live in. Pioneer Valley is certainly doing its part, looking forward to the day, “hopefully soon,” says Mai Tai Fighter, where there is a second (and more) all-ed team out there. That would be a trend worth uniting for. We are also barred from WFTDA because our league competitors are not all women and we have no intention of divorcing our teams. However, since we recently switched business structures from an LLC to a non-profit run by a board of directors, I’m not sure whether the “51% owned and operated by women” restriction still applies or not. Also, minor typo: our women’s A-team is Western Mass Destruction.